I have a wonderful cookbook called Mrs. Fields I Love Chocolate Cookbook. I received it for a Christmas gift from my sister Lauri several years ago. Every recipe in this cookbook has something to do with chocolate. I guess you could say that it is my kind of cookbook, being the chocolate lover that I am. The recipe that I am posting about now is actually a tart in the cookbook, but since I don’t have a tart pan I make it in a pie dish. It may not be quite as elegant as a tart, but I am sure it tastes just as good made into a pie. I love to make this pie when company is coming and most of our kids were home this weekend so it was a good excuse to make it. If I made it when Mike and I were just at home I could see me eating the majority of the pie, because I love it so much and that would not be a good thing. I like to change it up when I make it. Sometimes I make it with milk chocolate to give it a milder taste of chocolate and sometimes I make it with semisweet chocolate to give it more chocolaty. 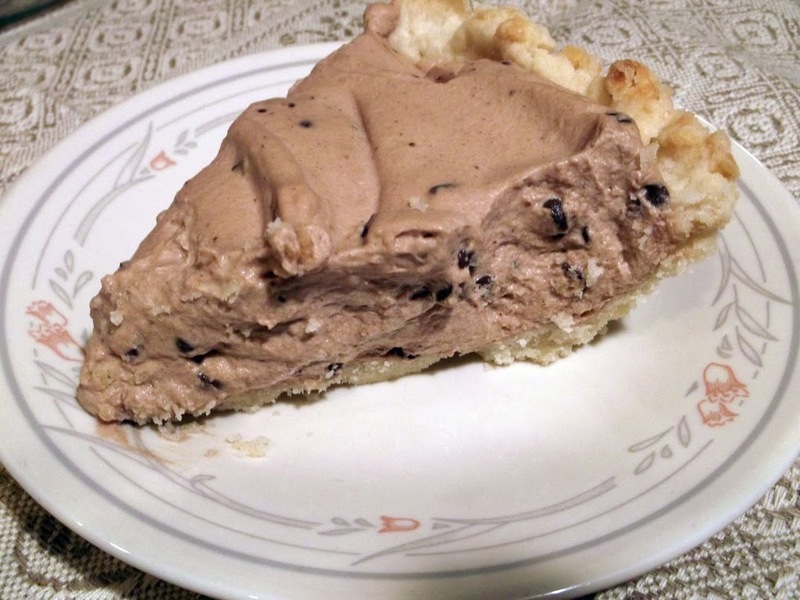 I have not tried this but if you took mint chocolate chips and added it to this pie, I think it would be amazing. Oh and I did not use the crust that is listed with this recipe. I like to use an easy one that I have. The pie crust that I use is one that you don’t have to roll out, you mix in the pie plate and pat it out; so easy! So if you are looking for a tart/pie that is light and easy to make I would recommend this pie. Mix all ingredients in a pie pan until well blended. Pat dough out on bottom and sides of pan. Bake at 400 degree F for about 15 minutes or until lightly browned. Cool completely before adding filling. In a small saucepan, bring 1/2 cup of the cream to a simmer. Remove the pan from the heat and stir in 6 ounces (3/4 cup) of the finely chopped chocolate (or chocolate chips). Cover and set aside for 5 minutes, then stir the mixture until smooth. In a large bowl, whip the remaining 1 1/2 cups cream with the confectioners’ sugar and vanilla until soft peaks form. Gently add the chocolate mixture and fold it into the whipped cream. Fold in the remaining 3 ounces of chopped chocolate (just over 1/3 cup). 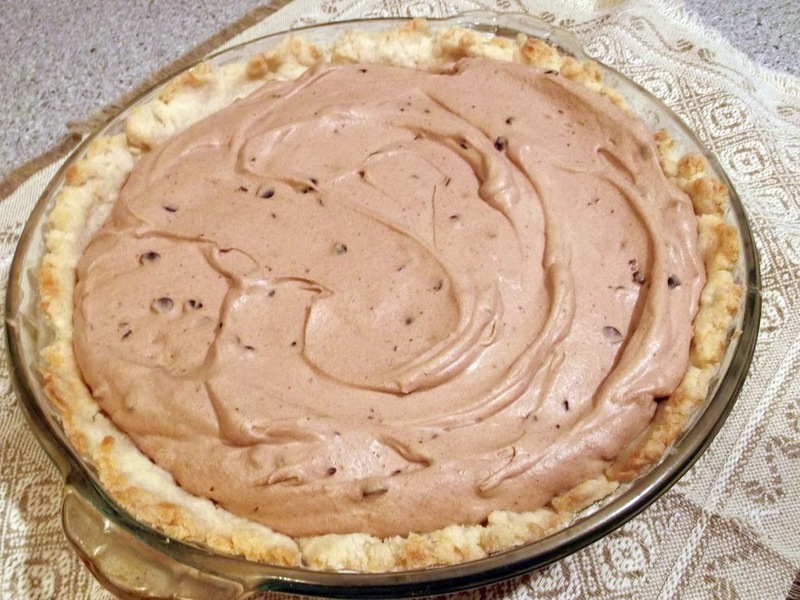 Spread the mousse into the cooled pie shell. Top with additional whipped cream and chocolate scrolls if desired. Note: For the chopped chocolate that is added to the filling, if I am using regular size chocolate chips I chop them up some, but if you don’t want to have to chop chocolate you can use mini chocolate chips, they work very well. Also I think that if you want a hint of mint in your pie you could use mint chocolate chips. 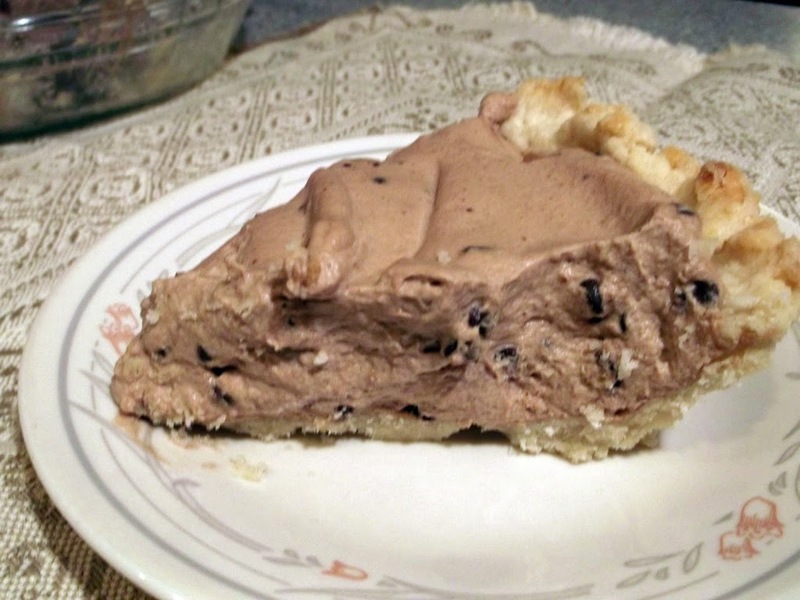 Oh how I would love a slice of this pie… yum! Looks delicious, love the fluffiness of the mousse. This would definitely work for the chocoholic in my house! YUM! What a delicious sounding pie!! I love chocolate mousse and I love how simple this sounds.